Please note that www.peopleofpraisemd.com has updated depositions which clearly indicate the congregation has been deceived. We the congregation will never submit to your unauthorized authority. It is incredible that you would want us to do this when you do not submit to the authority of the Pastor of the City of Praise. We do not recognize any authority you pretend to possess and we surely do not have any respect for you. In the past few weeks you have held unauthorized services not approved by the pastor of the Church. The Pastor of the City of Praise is Pastor Joel Peebles (not Elder Peebles). Let us emphasize this fact because it appears you have not attended service in the last 25 years. Bishop Peebles, Apostle Peebles, Pastor Jamie Peebles were Pastors at one time in either the Pastor or assistant pastor capacity. Our precedent and order from God has been for someone who was preaching to replace a pastor or assistant pastor if someone went home to be with the Lord. The Apostle ordained Pastor Joel as assistant Pastor when she authorized him approximately 14 years ago to function as the assistant pastor of the City of Praise including preaching 8’oclock service. You would like to see a service conducted by man to legitimatize his status; however, God has ordained him as the Pastor. We invite you to show us anywhere in the bible where man has to ordain a pastor into office. The Apostle already has ordained him but what scripture do you use to justify your unmerited belief that he is not an ordained pastor? In your reprobate state you somehow believe that Pastor Joel is supposed to submit to you. We have told you several times that we will continually resist you and never obey any directives you put out because this is our church built on our tithes and the lives of its’ founders. Surely you must realize at this point that you have no power or control over the congregation. Issac H. Marks and Omalley, Miles, Nylen & Gilmore is unable to help you because we know our legal rights. You have continually stated what the wishes of Apostle Betty Peebles were and are as if she is still speaking to you today. However, you refuse to address the congregation and tell us what you believe to be her wishes based on what she supposedly told you. We do not believe that her wishes would have been for you to sue her son four days after her death and use her “babies” (as she referred to us) tithes to perform this action. We do not believe that she wanted you to dictate to the pastor what he can and cannot do regarding spiritual matters as if you were God. No mother would want to see her son treated the way you have treated Pastor Joel. We do not believe she wanted you to conceal her for three months from Pastor Joel, the Peebles family and the congregation. We now know that Denise Killen, Clarence Jackson and Zain Sesay concealed Apostle Betty for months resulting in her having bed sores and a hold in her large enough for a man to stick his hand into her side. We again demand that you resign and let go of the assets and money under your control. We are in control of you attempting to fire Pastor Joel because you must realize that would create a disaster. The only matter left is your resignation and the return of the assets under your control. You will leave the only question is how soon. Members letter to the managing Partners of O’Malley, Miles, Nylen & Gilmore the law firm where the rogue six’s attorney works. I have requested from Mr. Issac H. Marks, your partner, information related to the tithes our congregation has paid that each of you take a prorata share of as principals in your firm. Your firm represents the City of Praise. The unelected trustees have utilized our tithes to sue our pastor and pay your legal fees. We only want to know what the fees and billable hours expended have been since your firm represents the City of Praise. We estimate you have billed $500,000. This estimate is based on approximately 1400 hours of work done at a rate of $350 per hour. I understand that the hourly rate you charge is higher than $350 for corporate clients like the City of Praise so the estimate could be significantly higher. Mr. Marks has continually refused to provide the information, and he has advised the unelected trusteees of the City of Praise to not provide records containing this information as indicated in the email below in violation of the law. As you can imagine as a church congregation we do not take great comfort in the law firm that represents the City of Praise having one of its attorneys advise the unelected trustees to violate the law and breach their fiduciary duty. On another occasion he had the unelected trustees swear and perjure themselves by attesting that they were elected by the congregation in our Maryland Articles of Incorporation. However, more outrageous than that is Mr. Marks intervened in a spiritual matter by attempting to contact Mr. Kevin Levar to dissuade him from holding a religious function which brought spiritual healing to many individuals. Please note at https://peopleofpraisemd.wordpress.com/videos/. the second video shows that Mr. Marks clearly involved himself in an attempt to stop a church function as authorized by the pastor according to the bible mandate that Christians must forgive one another per Mark 11:25. At a bare minimum if your firm represents the City of Praise you should assign another attorney to the matter who does not advise the unelected board to break rules and violate the ten commandments. Copied on this email (BCC) are only a small portion of members who are also interested in obtaining this information. We have stopped paying our tithes as we do not want them used to pay for your legal fees. We specifically have requested that our tithes not be used to pay for legal fees to your firm in any suit against us or Pastor Joel. We have limited our tithes by direction to the unelected trustees who have copies of our request. However, we understand that the unelected trustees have within their control an estimated $9 million to $14 million which consists of tithes we previously paid. Since O’Malley, Miles, Nylen & Gilmore has refused to provide the congregation with the information we have requested, we must let the organizations we do business with know not to utilize your services including developers. Our congregation has thousands of members and we must now contact all the media outlets in the area if we do not receive the requested information by December 8, 2011. This information should be easy to retrieve as you are mandated by your Rules of Professional Responsibility to maintain the information. Your firm has violated these rules if you had Mr. Marks advise the unelected trustees to violate the law. Rule 5.1 requires you all to ensure that your partners do not violate these rules or you yourselves have violated the rules. Mr. Marks has violated Rule 4.1, Rule 1.2 and possibly Rule 1.5 if the fees are excessive. I have already informed Mr. Marks who the point of contacts are for the congregation. In addition, our congregation has contacts and /or are affiliated with the Governor’s office, County Executive’s office, Members of Congress, State Senate and State Delegate’s who support our efforts for the work we do in the community. We are also prepared to purchase an ad in the Washington Post and local newspapers asking you publicly and the unelected trustees why we cannot obtain records from our church because of your advice to withhold the records. We are also prepared to protest outside your office with the media present. Most members like myself are confused as to why a firm that represents the church refuses to provide information allowed by law and further advises the unelected trustees not to provide the information. Since Mr. Marks has asked me not to contact him and also advised the unelected trustees of our church not to provide us this information I contacted you. Members you will have to individually contact directly the principals, as well as the unelected board of trustees, that this email is addressed to requesting the exact amount that O’Malley, Miles, Nylen & Gilmore has billed our church in legal fees to fund a lawsuit against Pastor Joel Peebles, if you want the information. I pray you have greater success in obtaining the information. Please forward this email to other members who are too numerous to list as well as our friends, political allies, business associates and other churches. Ask them to also request the information for us. wshipp@omng.com, mlevin@omng.com; llucchi@omng.com; jfredrickson@omng.com; ltaub@omng.com; nslepicka@omng.com; mosnos@omng.com; smccash@omng.com; ftroll@omng.com. Additionally the website for O’Malley, Miles, Nylen & Gilmore is http://www.omng.com/index.htm where you can view the principals and contact them by phone if you desire to ask for the information. If you believe that a complaint should be filed against Mr. Marks or any lawyer with this firm please see http://www.courts.state.md.us/attygrievance/complaint.html. As one of the elected spokespersons by a majority of the congregation of the City of Praise, I will contact Linda Pyles, Gloria McGruder, Clarence Jackson, Clifford Boswell, Dorothy Williams and Denise Killen anytime I am requested to send a letter by the congregation. I previously informed you that I and three other individuals were points of contact for the congregation. However, you said we were not. You have no business in spiritual matters regarding the church, any second year law student is aware of that simple fact. Additionally, let me correct you again Pastor Joel is the Pastor not an Elder and spiritual matters are out of the purview of any outside entity. My tithes and those of the congregants of the City of Praise pay your salary. So what makes you think you can instruct us not to contact your office again? I really have no desire to contact you or your office if I could just get the information the congregation has requested. Subtitle 3 related to Religious Entities section 5-307 states that “the trustees shall: (1) Keep an accurate record book; (2) Allow inspection of the record book by members of the religious corporation; and (3) Allow the proceedings recorded in the record book to be presented before a public meeting, if required by five or more members of the religious corporation.” The congregation has met the requirements for section 5-307 fully. If you were not counseling them to violate the law they would have complied and presented the books per statute. I believe it is malpractice on your part to advise them not to provide this information to the congregation and to willfully disregard the requirements of the statute. In addition, O’Malley, Miles, Nylen & Gilmore have sanctioned your actions. Your actions also violate the Rules of Professional Responsibility. The only reason I contacted the managing partner of your firm is because we have asked Linda Pyles, Gloria McGruder, Clarence Jackson, Clifford Boswell, Dorothy Williams and Denise Killen to show us the record books and O’Malley, Miles, Nylen & Gilmore is advising the invalid trustees of our church to violate the law. Now you are telling us not to contact your firm because we want to know how much of the congregations’ tithes have been spent on a lawsuit? How is that unreasonable? It is the congregation that has funded the lawsuit and paid O’Malley, Miles, Nylen & Gilmore. We never have to contact O’Malley, Miles, Nylen & Gilmore again if you will provide the information we requested. The law allows us to have the information on the record books and this includes what you have been paid. Linda Pyles, Gloria McGruder, Clarence Jackson, Clifford Boswell, Dorothy Williams and Denise Killen refuse to provide the information based on your counsel and you are telling me not to contact O’Malley, Miles, Nylen & Gilmore to obtain it. 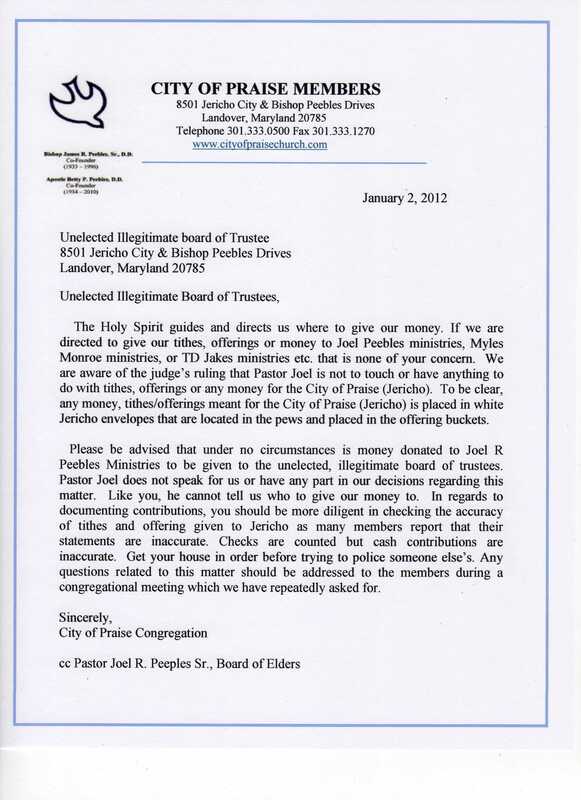 We do not desire to contact your office, but we demand to know what the legal fees are for the suit against Pastor Joel. O’Malley, Miles, Nylen, & Gilmore have billed extensive hours in the suit against Pastor Joel. I am trying to get the information so you and your managing partner do not have thousands of people sending you emails or calling. If you prefer that all of the people that have asked me to obtain the information contact you and the managing member of your firm directly that is fine. I think you should let your firm know that this matter is only going to grow into a larger issue. We have thousands of members of the congregation who support Pastor Joel and have no confidence in this illegal board as evidenced by their signature on a petition. I am trying to alleviate problems by obtaining the information as requested, but if you refuse then please do not blame me for asking for information that is allowed by law to members of our church. What kind of law firm treats a congregation this way whose tithes pay your legal fees? If you do not want to provide it and are advising Linda Pyle and the others not to provide this information that is illegal. We can ask any attorney that works for the media to look at the statute, and I am certain they will reach the same conclusion. Landover, MD November 6, 2011 – On Sunday, November 6, 2011 after a week of demonstrating in dismay over attempts by a group of six employees to overthrow the legitimate church board, the congregation of City of Praise church held an election to select a church board approved by the people. The church’s legal ministry headed by church member Rod Chavez determined that the articles of organization that the six employees drafted states that they were elected by the congregation. The ballots were counted by an independent accounting firm. Results will be announced on Monday, November 7, 2011. Landover, MD November 12, 2011 – On Thursday, November 10, 2011 even though an election has been held and demonstrating has occurred; the City of Praise Church has declared that the authority of God rules in their Church and not six employees who are in disobedience to God’s word. “We have decided that these employees Lynda Pyles, Gloria Mcgruder, Clifford Boswell, Dorothy Williams, Clarence Jackson and Denise Killen have caused enough interference with church operations” said Rod Chavez a member of the church’s legal ministry. “We have delivered letters to the legitimate board and these six individuals which outline that we as a congregation are within our rights under God’s law and man’s law” said Chavez. “There is only one possible outcome and they must leave. Like Pharaoh with Moses if they refuse they will find themselves actually fighting against God. We love them but cannot allow them to affect the ministry through their direct opposition to God’s ordained order in his house” said Chavez. We greet you in the name of our Lord and Savior Jesus Christ. 1. All costs for attorney fees for Maryland Case CAL 10-33647 to include copies of any attorney bills, retainer agreements, and documents indicating cost for services that that board has expended. 2. A list of the names of employees who receive salaries, payments or stipends as authorized by the board, including board members who are employees. Regardless of the source of income show all salaries, payments or stipends made to board members in their capacity as board members paid from Church funds including funds from any Church holdings. 3. Copies of board minutes related to pay increases for board members acting in either their capacity as either employees of the Church or their capacity as board members. 4. Copies of Church Bylaws and Church Constitution. 5. A list of the names of all banks that the Church does business with for any Church operations, loans, business or that we maintain any lines of credit with or accounts. 6. A copy of all the Board’s policies and procedures. 7. A copy of the board’s criteria for selecting contractor’s and vendors. This information has to be part of an accurate record book that we have requested. If you have not maintained accurate records you are in violation of your fiduciary duty as Trustees as well as your obligation to the members and more importantly to God. We have a right as members of the Jericho City of Praise to request this information legally and morally. If you refuse to provide the information as requested and in a public meeting you will be violating your duty as a Trustee and breaking the law. If you do not provide the information after bible study Wednesday November 16, 2011, in a public forum at or about 8:30 pm, we will notify the proper authorities that you are violating your fiduciary duty as Trustees by refusing to provide information allowed by law. In addition, your refusal will further demonstrate your unsuitability to serve as Trustees by willfully violating the law. We insist on complete transparency with the manner in which our tithes and offerings are used to conduct the mission of the Jericho City of Praise to include its holdings. Please find attached a recent media release. We again are urging you to respect God’s law and vacate the position that you have illegally obtained, according to the word of God. We are considering picketing outside of your house at 5913 E. Boniwood Turn, Clinton Maryland; however, as an act of love we will not exercise this option at this time. Please note that in the near future if we are forced to exercise this option it will be done decently and in order because we genuinely love you but you are being deceived by opposing God’s ordained authority. Additionally, if we do picket outside of your home we will invite the media. The only possible resolution to this matter in the City of Praise is for you to immediately resign from your illegitimate post as Trustee. Please find attached a recent media release. We again are urging you to respect God’s law and vacate the position that you have illegally obtained, according to the word of God. We are considering picketing outside of your house at 9104 Westphalia, Upper Marlboro Maryland; however, as an act of love we will not exercise this option at this time. Please note that in the near future if we are forced to exercise this option it will be done decently and in order because we genuinely love you but you are being deceived by opposing God’s ordained authority. Additionally, if we do picket outside of your home we will invite the media. Please find attached a recent media release. We again are urging you to respect God’s law and vacate the position that you have illegally obtained, according to the word of God. We are considering picketing outside of your house at 336 Wesmond Drive, Alexandria Virginia however, as an act of love we will not exercise this option at this time. Please note that in the near future if we are forced to exercise this option it will be done decently and in order because we genuinely love you but you are being deceived by opposing God’s ordained authority. Additionally, if we do picket outside of your home we will invite the media. Please find attached a recent media release. We again are urging you to respect God’s law and vacate the position that you have illegally obtained, according to the word of God. We are considering picketing outside of your house at 2502 Fort Drive, Suitland Maryland however, as an act of love we will not exercise this option at this time. Please note that in the near future if we are forced to exercise this option it will be done decently and in order because we genuinely love you but you are being deceived by opposing God’s ordained authority. Additionally, if we do picket outside of your home we will invite the media. Please find attached a recent media release. We again are urging you to respect God’s law and vacate the position that you have illegally obtained, according to the word of God. We are considering picketing outside of your house at 3611 Scugg Place, Springdale Maryland however, as an act of love we will not exercise this option at this time. Please note that in the near future if we are forced to exercise this option it will be done decently and in order because we genuinely love you but you are being deceived by opposing God’s ordained authority. Additionally, if we do picket outside of your home we will invite the media. There is no scriptural precedent for a board to serve as the spiritual authority of a local church. God has always chosen to select someone of His choosing to serve as the spiritual authority to oversee the sheep of His pasture. That person was God’s spokesman who is delegated to exercise authority to speak and act as God’s representative. Christ’s headship over the church both universally and locally is manifested via the Pastor. There are not two heads, only one. No board especially an illegal/illegitimate one serves as head. Pastor Joel was graced and called by God to be a pastor. Obviously, Apostle Betty recognized that and ordained him. He was not the senior pastor because the senior pastor was still alive. But now that she has gone to be with the Lord, God had a pastor prepared for that time. much the same way that Joshua, Moses’ assistant became the new leader after the death of Moses. There was no board involved. The congregation is absolutely right all the way around. And if their tithes and offerings are not being used properly, they have every right to ask for an accounting of the monies and to direct their giving to where the Holy Spirit guides. Its funny when prosperity pimps are demanded to show proof that monies sent to them are being used for ministry or for personal gain everybody from politicians to lawyers agree. But in this case when there is a blatant misuse of members offerings, lawyers and others want to put up a fight. If this illegal board really were operating according to both the Word of God and the Spirit of God They would step away so that the sheep can rest and be fed in a hostility free environment, and the testimony of the Church of Jesus Christ wouldn’t suffer. It is spiritual witchcraft at its worst controlling manipulating, and having a hatred for true spiritual authority. Its God’s House, God’s money and God’s man. Do these individuals really want to engage in a fight with God?? I am grateful everyday that where I worship we are taught to fear the Lord and do everything by the Word. My prayers for the congregation and pastor Joel will not cease until order is restored! i just can’t for the life of me understand why a godly woman would commit a felony by checking herself into the hospital under someone else name. Especially when she could have let the hospital know who she wished and who she wished not to visit her. Secondly, I can’t understand why the apostle wouldn’t let the congregation know she was forming a new board of trustees, even if she didn’t want to reveal their names. At least the congregation would have been informed. Thirdly, i can’t understand what court would uphold a final will that was notarized by one of the beneficiary? That notary should have been void. I’m praying for Bishop Joel and the City of Praise… this shows even if you have bylaws, rules, and things in place, the devil still can sneak in and corrupt things… I pray this is a lesson to every congregation, pastor, and boards of trustees. Rev. K thank you for your prayers. The lawyer for the rogue board asked that the case be specially assigned to Judge Jackson. Their supporters said early on that they could not lose with this judge. Every time our case was set before another judge we won. The last case that the judge dismissed we actually had a default judgment against these crooks by another judge. We went to court expecting the court to grant our request for a congregational vote to elect trustees only to have Judge Jackson reverse that decision. They then filed motion after motion which stalled the case for over a year. We expected to have a Jury trial which was scheduled for February 2014 only to have the Judge dismiss the case the week before it was set to go to trial. The judge never saw the depositions. We have not had our day in court. We now have 4 active cases. Three are in a different court. The last case is Bishop Joel and Chairman Meadows case where the court of special appeals reversed Judge Jackson’s decision and sent it back for a jury trial. Please continue to keep us lifted in prayer. The crooks are spending money like water on public relations to try and get the saints all over the country to support them. Smoke and mirrors.